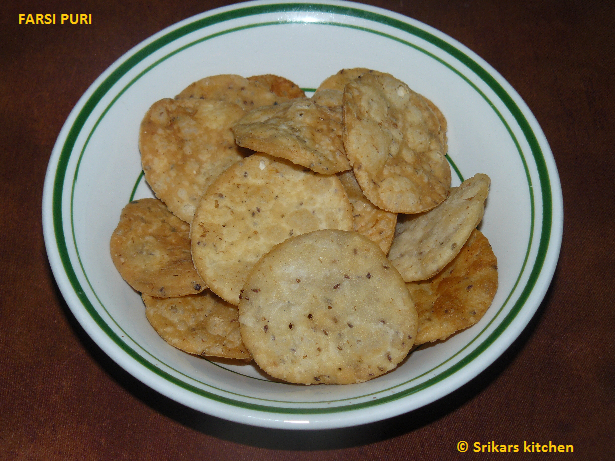 Farsi puri is a crispy flat bread.These puris are easy to make. we can store it for two weeks in an airtight container.It is very good afternoon tea snack. Take a bowl, add all purpose flour,melted butter,ajwain seed, crushed pepper,salt & mix well. Add water slowly & mix well. & make a fine soft dough. Rest the dough min 20 mins . Divide the dough into even sized balls, dust flour & flatten it with rolling pin. Take round shape cutter & cut into small roundells. Using folk or knife, prick the puris. Deep fry the puris & keep it in a airtight container. Note: You can replace ajwain seed with cumin seed. VERY NICE POORI. THANKS FOR SHARING. Delicious and flavourful looking pooris. The best part is you could store them fr days. It looks yummy and nice snack . Delicious and I love the ajwain flavor in this..
looks sooo tempting n delicious snack..